all ages & Physical abilities welcome & we can supply quality lodge rifles & SHOTGUNS. OVER 35 years guiding & outfitting in n.z. 13 year old Adam's spring bull Tahr taken after a big day on the mountain with with his dad Knud & guide Hamish. First time shooting a magnum rifle, a great shot with Hamish's custom 7mm magnum & 180 grain Berger bullet. Texas group with their Red Stags. 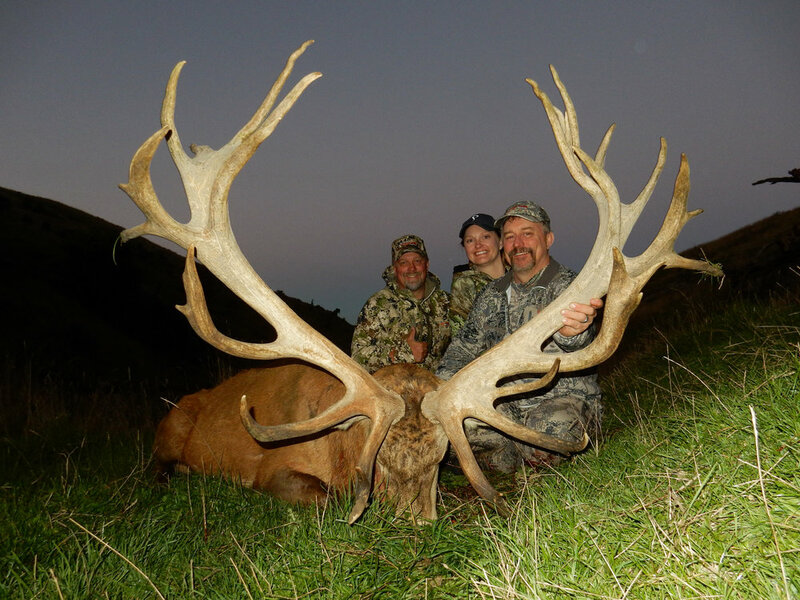 We offer Stag hunting for exceptional trophies on private land. 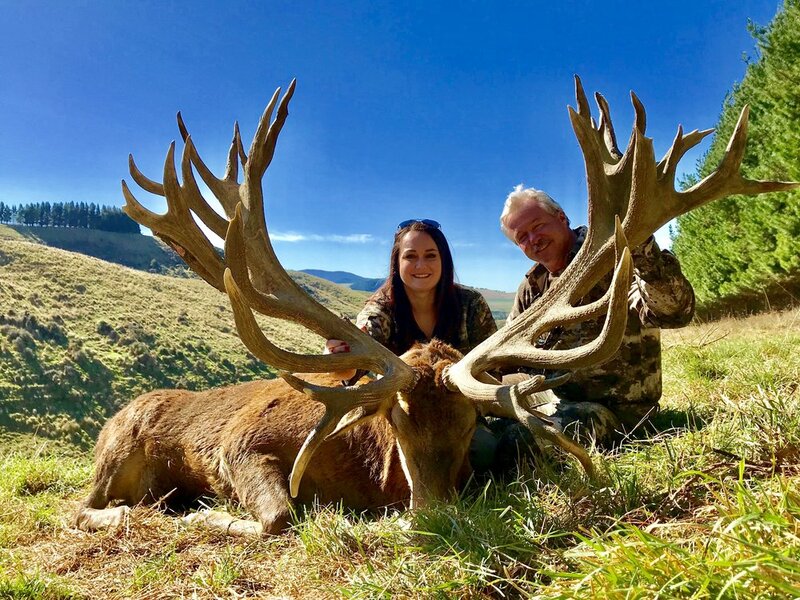 WE OFFER EXCEPTIONAL VALUE for hunts combining new zealand's number one purpose built hunting lodge and hunting that all of your family will love! Our Stags have massive heavy beams, exceptional length of tines and some have drop points and other non-typical features. 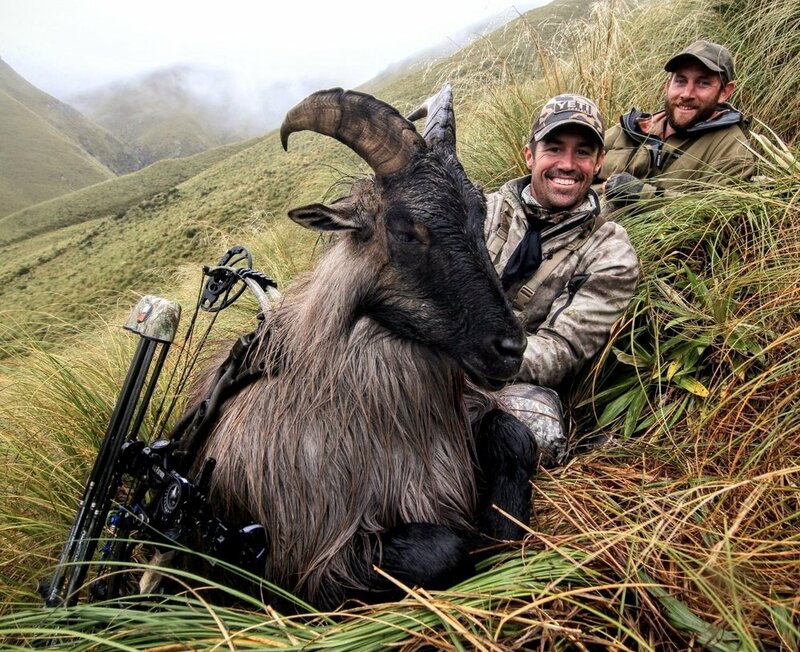 Hunt for the best trophy bull Tahr we can find. Rifle & Archery. Rolling average of 12 6/8 inches & 8 1/2 years old. Hunting season open all year for Tahr. 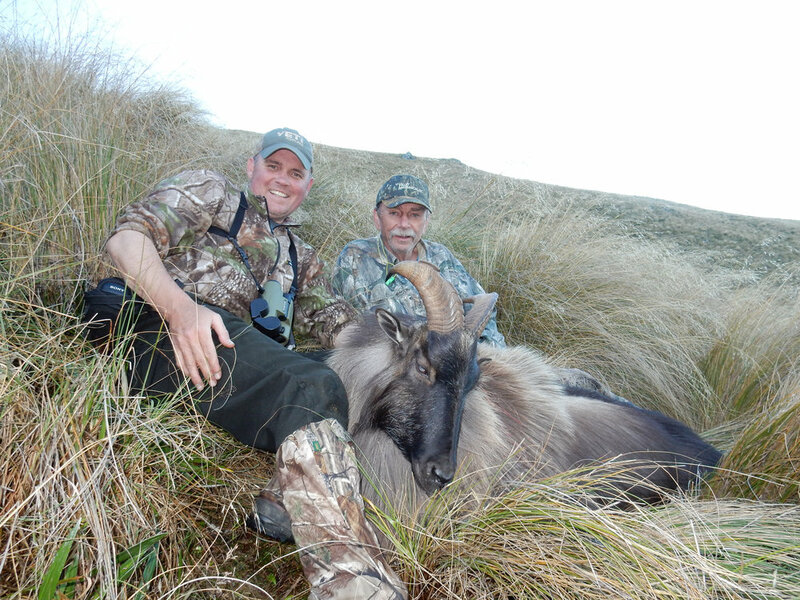 * Archery Tahr hunts require 2 extra days of hunting. Additional fee is $600 for the 2 days. All foot hunting with 4WD access. No helicopter fees required. Our most popular hunt! Stag (330-360 SCI), Tahrt & Fallow best we can find. CONTACT US for full details on this outstanding hunt! Exceptional post rut bull Tahr foot hunting. See mobs of multiple bulls. The bulls are in full winter skin and make for an outstanding trophy mount. Add management nanny Tahr for $1000 trophy fee. Limited number of Chamois permits available also. We are one of the longest established outfitter/guides in New Zealand, with over 30 years experience. Our hunts are based from our magnificent 11,000 square foot luxury Woodbury Safari Lodge, on the South Island of New Zealand and in the heart of Stag, Tahr, Fallow & Chamois country. The lodge has a relaxed family atmosphere backed by a small team of friendly staff. Our private hunting areas total over 55,000 acres plus a large Govt. Hunt Concession on public land. We host hunters & families from all over the world including the USA, Canada, Asia & Europe. Woodbury Safari Lodge - base of operations for Fraser Safaris New Zealand - owned by the Fraser family. Our lodge has a big open fire - great to home to after a long day of hunting! 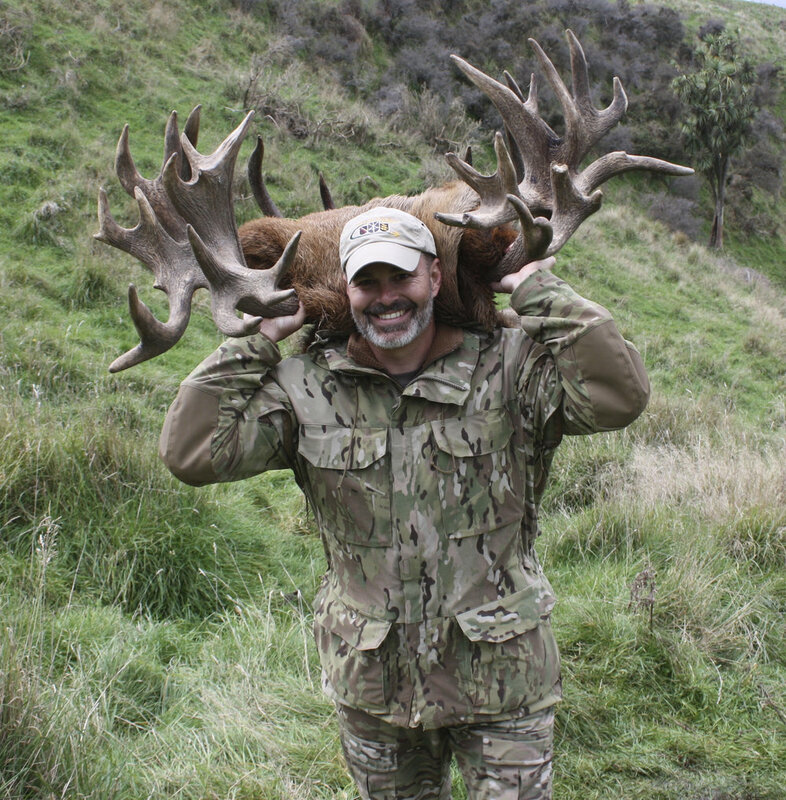 If you are looking for a high quality hunt for world class South Pacific trophies, challenging free range & estate hunting areas, expert professional guides combined with exceptional luxury lodge accommodation & chef meals - talk to us now for a competetive price, book your hunt dates and let the planning begin for your New Zealand adventure!